Finding the perfect toy for your kids, your nieces or nephews, or any other child in your life, can be a great feeling. Watching them rip through the wrapping paper, the surprised expression, and the endless amount of joy they get from playing with your gift can make the holiday hustle and bustle disappear. However, it's not often that we stop and think, "Is this toy safe?" We see it on the wish list, and we know it's what they want. The last thing we consider is if it will cause them any harm. The surprising fact is that more than 265,000 children visit emergency rooms each year due to toy-related injuries. Non-Motorized Scooters – These are among the most dangerous and often cause more injuries than any other toy. Balloons – After popping, these become choking hazards, especially to younger children. Toy Chests – Small kids can get trapped within toy chests. 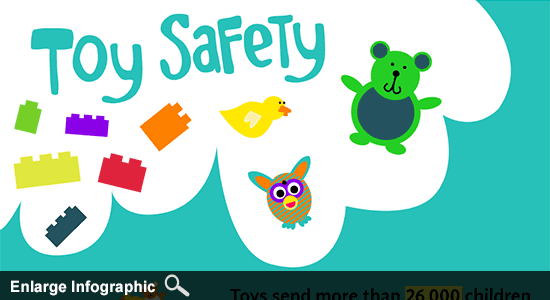 Stuff Toys/Dolls – Any small parts can create choking hazards for children. Inflatable Toys – These can cause falling accidents when left on land or drowning hazards when used in the water. Trampolines – About 100,000 injuries every year are directly related to trampoline accidents. Magnets – Sometimes detaching from a toy, magnets can easily be swallowed, yet difficult to pass through the digestive track. They can cause serious, life-threatening damage. Small Rubber Balls – These tiny bouncy balls can pose a serious choking risk. Any Small Toy – Tiny toys will always create a choking risk. Injured By a Dangerous Toy? The holidays can be filled with fun, happiness, and joy, but sometimes accidents cause injuries – even to the ones we love the most. If your child was hurt this holiday season, contact our law firm for a free case review. We'll listen to the details of your situation, and help you recover the compensation you and your loved ones deserve. Sources: "Top 10 Most Dangerous Toys for Kids." The Stir. April 26, 2013. "Toy-Related Deaths and Injuries, 2001." U.S. Consumer Product Safety Commission. November 2012.